I’d have to say that as a young person brought up in an evangelical “churched” environment, this was pretty much the conclusion I myself came to, though I often felt guilty for feeling that way. I heard regularly that a good Christian daily reads the Bible and prays. My Godly parents demonstrated this to us from our infancy, by regular, daily “family worship” which consisted of a chapter from a Bible Story book or from the Bible itself, and then prayers in which each member of the family was expected to participate. Bible reading was expected to become the goal of our “personal” devotions which we were to develop as soon as we could read. We were also encouraged to memorize scripture, and I recall the whole family memorizing many a Psalm or other scripture passage aloud together as we traveled on day-long drives. Regular contests with motivational prizes in Sunday School, at Christian “clubs” like Pioneer Girls, and at Bible camp also encouraged these devotional activities. Participatory prayer was not so much encouraged, except at home in family worship, and despite my parents efforts, unfortunately much of the time my “prayers” became simply a couple of rote lines which I repeated day after day. As I grew older, I grew to dread my turn at praying, as family worship was held just before leaving for school, and if my friends dropped by to meet me, I would be forced to pray in front of them, which I found embarrassing, partly because my prayers were indeed foolishly rote in nature, and because although I had become an accomplished Bible reader, having read it through a number of times, and always winning “sword drill” and “Reach for the Top” Bible trivia-type contests, as well as memorizing much scripture (I found the prizes motivating! ), somehow all that “exercise” had only stimulated my brain, but had not made the transition to a heart understanding. Therefore prayer held little meaning or interest for me. So devotions took on for me the typical “modern” definition and viewpoint. When I finally reached the end of myself, in my mid-twenties, and came to know Jesus Christ as my personal Saviour, I realized that to grow in relationship with my Lord, I would need to come to really know Him – not just know about Him – and I realized that real devotions should be intrinsically motivating, as they are so important in reaching that goal of relationship with God. But old habits and thought patterns are hard to break, and I was also busy mothering – 5 children in less than 8 years – as well as working, volunteering, helping in the church, trying to be the super woman my generation was encouraged to become. Although I really tried to develop a “devotional life” there was still something clearly missing, and my devotions were sporadic at best. Fortunately, our God is faithful, and bit by bit He started changing my self-sufficient and self-centered viewpoints, as He allowed situations to come into my life which I could not handle or fix or solve by myself, nor even with the help of others. Gradually – I can be a slow learner! – I was forced to learn to throw myself on my Lord and let Him fulfill His plans and purposes in my life, instead of trying to plan my life myself, and depend on my own abilities and skills. I was forced to read beyond the surface “trivia” level of Scripture to discover the true principles of Godly living, and to actually meet my living Lord, discovering the depths of His love for me. And of course as I came to know Him, prayer became no longer meaningless repetition, but real conversation with my Father and Saviour who loves me, totally unworthy as I am, so much so that He gave His life to die for my sins. Amazing grace, indeed! The wonder of it overwhelms me still! I discovered prayer was not just a rote list of “gimme’s” but rather true worship, adoration, thanksgiving, interactive conversation, back-and-forth love, confession and being forgiven. I learned to pray individually, to pray in groups, to pray by journaling. I learned what it means to “pray without ceasing,” to reflect on scripture throughout my day during all my activities, to develop a sense of God’s presence in all things. True, I still get distracted sometimes. I still have too many times when my first reaction is to go it alone in my own strength. The old ways of thinking about devotions pop up. The enemy, after all, hates true devotions, and fights it all the way. Sometimes life seems so dark, and God seems far away. Yet it is in those wilderness experiences that devotions are especially important, as I must remind myself of the solid facts about my Lord which His word presents, and trust Him that He is hearing and responding to me, no matter how alone I might feel, because His word is as totally trustworthy and faithful as He is Himself. Devotions, as defined in Webster’s old fashioned 1828 dictionary, relate to these very things I have experienced as I have met my Lord, and grown in relationship with him. Indeed, as God Himself teaches us in His Word, there is great value in stepping out of the present, no matter how progressive and pertinent it may seem to us, and look back to the old ways, the markers and boundary stones, the deep and wise thoughts of God’s people who have gone before. And so it is with old Daniel Webster, who knew God, who understood that devotions are far more than an empty religious rite practiced by people who have nothing better to do, or who are doing it out of a sense of duty or even guilt. 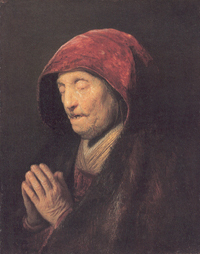 And so he expressed the true meaning of devotions, which can only arise out of “the state of being dedicated, consecrated… solemnly set apart for a particular purpose….” That purpose must ultimately come from a relationship with God Himself, and results, in the devotional life, in “A solemn attention to the Supreme Being in worship; a yielding of the heart and affections to God, with reverence, faith and piety… in prayer and meditation.” Yes, devotions are still “performance of religious duties,” which require a Christian to “be regular in his morning and evening devotions,” but they are also much more. They are “An act of reverence” which arises out of “Ardent love or affection; attachment manifested by constant attention… Earnestness; ardor; eagerness.” Because of the wonderful grace and love of God, devotions as in their formal morning and/or evening form, and devotion as the practice of walking constantly in the presence of the Lord, brings me into ever-deepening love with my Saviour – devoted to Him, Who is my all!